Supply chains fueling multinational companies control 80% of world trade and 60% of global production. 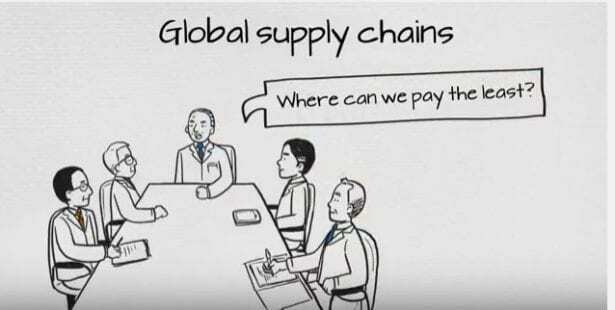 Economic globalization has created benefits for consumers, business and suppliers, but the practice of sourcing goods and services from countries where wages are low, laws are lax and governance of supply chains is ineffective, sometimes deliberately so, also has resulted in negative consequences for people who should be its core and ultimate beneficiaries: the workers. The supply chains fueling multinational companies now control some 80 percent of world trade and 60 percent of global production. Supply chain workers—in textiles, retail, fisheries, electronics, construction, tourism, transport and agriculture—are integral to the global economy, yet often face pover­­­­ty wages, dangerous and unsafe working conditions, and eroding rights on the job. Nearly half of the world’s largest companies directly employ just 6 percent of the workers in their supply chains—the remaining 94 percent are part of the hidden workforce of global production. This marginalizes workers and often contributes to a denial of their fundamental human and worker rights. When global brands push suppliers to squeeze wages, the result is often jobs that are insecure and informal, involving dangerous workplaces, forced overtime and even slavery. At the same time, governments may seek to attract investment by presenting their countries as friendly to business by failing to enact or enforce protective laws or by denying workers the right to freedom of association.